Say you have a house full of dinner guests and just as the main course is finished you realize, yikes, you forgot dessert. If that ever happens to you, as it did to me last week, fear not. Just excuse yourself for a moment and whip up these fabulous brownies. 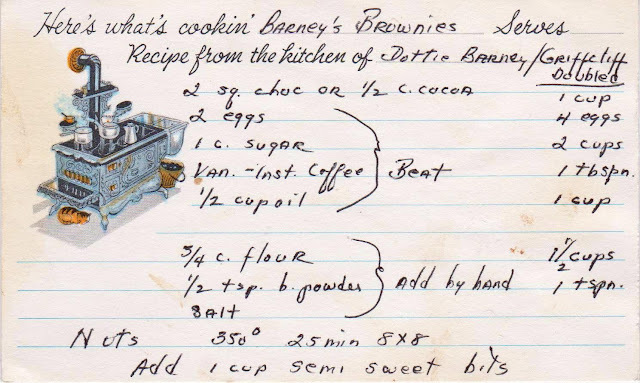 This recipe is from the kitchen of Dottie Barney, who may be the daughter of Dot (see Graham Cracker Cookies); both recipe cards were found in the collection of Olive Facey. * What's so unusual about these brownies is that they are delicious despite the fact that they contain no butter! I made these last week, following our family holiday latke-eating Christmas tree-trimming party, the perfect celebration for our Jewish-Italian clan. I was so focused on frying latkes, that I did not sufficiently focus on dessert. But I literally put Barney's Brownies together in just a few minutes (hence, no time for production photos). And it took just a few minutes for them to be consumed. The DD and her boyfriend Josh licking the bowl. Line the pan with parchment or foil so you can lift the finished product whole from the pan. This makes cutting and serving them a snap. What remained was modern (brownie) art. I used cocoa powder instead of the chocolate, as I was rushing and didn't want to wait even a few minutes for the chocolate to melt. I also did not use nuts (the DS hates them), and mixed the chocolate chips into the batter at the end. I also used 1/2 tbls. of instant coffee granules (the Italian expresso kind) and added about a tsp. of vanilla, as I couldn't really read that ingredient amount well. *This bit of family friend archeology is from Olive's son Stephen. Dottie lives in Marblehead, Mass., near where Olive did. Got this nice note yesterday via email. I recently tried the recipe for "Barney's Brownies" exactly as written (with the addition of walnuts) and they were delicious! Thank you for a wonderful recipe! I regularly read your blog and love the whole concept of it. Wonderful idea! I have made these twice, both with nuts and without. Either way they are yummy! At my ds suggestion, I added a lot of chocolate chips. They were very gooey when warm and were chocolate overload when cooled but equally good either way. This recipe is a keeper and is so easy to make. I doubled it for a 13 x 9 pan, too. I have to make a dessert this weekend and Barney is going with me, again! Just had to leave a coment- baked these this weekend and they are now probably my favorite brownie recipe. Thanks for sharing!! My family recipes are written on these same cards! I purchased the cards in the 1980's from Current Catalog, a mail order company that sells stationary, cards and like kind gifts. What a treat to see this!